Available from online vendors so I will not be posting a sample. Presented here to share the cover art and notes excerpt. From the back cover: Chicago, Nov. 19 (UPI) – Orchestra Hall rocked last night when long hairs and short hairs harmoniously "blew their brains out" before a flabbergasted but appreciative public. The occasion was the musical union, possibly for the first time in this country, of a jazz band and a symphony orchestra. 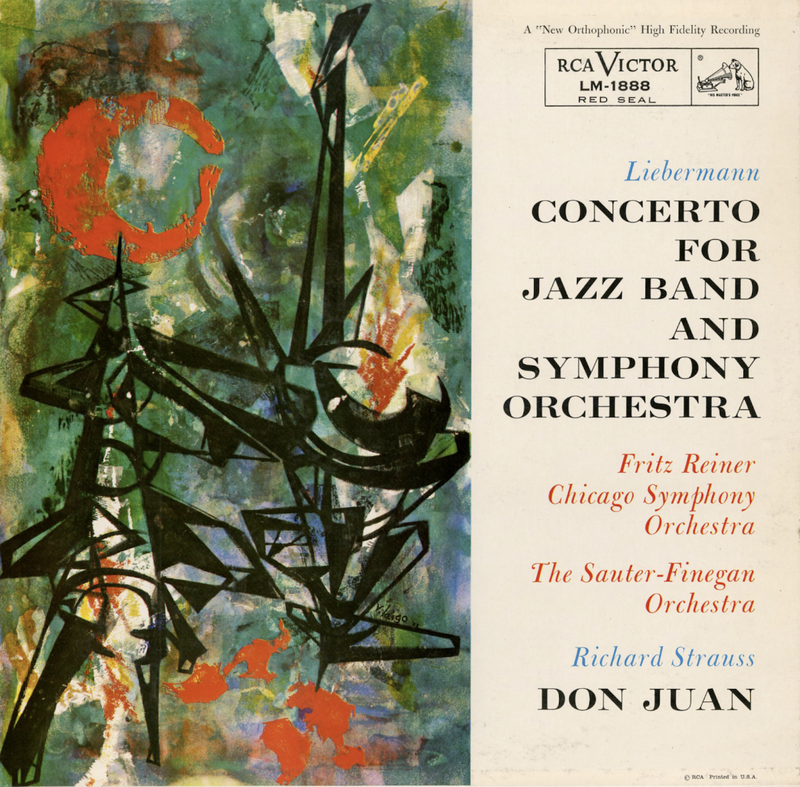 The Chicago Symphony Orchestra, conducted by Fritz Reiner, and the Sauter-Finegan Band, a modern jazz group, combined to give a rendition of Rolf Liebermann's Concerto for Jazz Band and Symphony Orchestra." A mixed crowd of "hepcats" and classicists heard the cacophonous exposition and voiced their approval by giving conductor Reiner and his orchestra one of the longest ovations ever to be heard on "Symphony Night" in Orchestra Hall. The Sauter-Finegan group was easily distinguishable from the rest of the orchestra by the bright red band jackets they sported. Throughout the piece Reiner swayed to and fro on the podium and gave the impression of enjoying himself tremendously. After the performance, he said he saw a great future for this new type of music. "For the last 150 years," he said, "dance music and classical music have gone their own ways. Tonight I have tried to explain that both kinds of music have a close connection." Reiner added he felt this amalgamation would do a great deal to unite both "long hairs and short hairs" and would in the long run do much to raise the public level of musical appreciation. Also from the back cover: The Suatre-Finegan Orchestra is the standard-bearer of an avant-grade and intellectual form of jazz which has gone far beyond the jazz forms known as "New Orleans," "Kansas City," "Chicago" and "bebop". Sauter and Finegan formed their band in 1952 and signed to record for RCA Victor. Brooklyn-born Ed Sautre, who began working as a bandana at the age of 17, had written arrangements for the legendary songstress Mildred Bailey and bandleaders Benny Goodman, Tommy Dorsey, Artie Shaw and Woody Herman. Bill Finegan, a New Jersey native, had arranged for Glenn Miller and Tommy Dorsey. From Billboard - February 19, 1955: It is seldom that a contemporary work stirs up a hornet's nest of critical controversy – or inspires the public interest – that Lieberman's concerto has. The introduction of the 'jump.' the 'blues' and the 'boogie boogie' into a serious symphonic creation was a radical innovation for which few longhairs were prepared. However, both at the premiere in Germany and at the first American performance of the concerto last November, this work was unquestionably a popular success, and public curiosity should induce healthy sales of this unusual disk. An added sales spur is the superb reading of "Don Jaun" on the reverse side. Sound in both cases is magnificent.